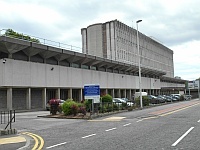 The nearest National Rail station is Aberdeen. 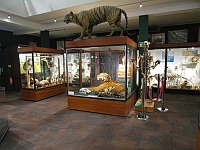 The building contains the Zoology department, the Natural History Centre and the Zoology Museum. 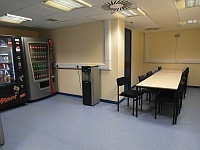 The dimensions of the Blue Badge parking bay(s) are 400cm x 280cm (13ft 1in x 9ft 2in). 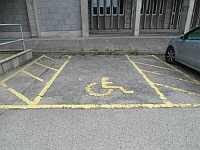 The nearest Blue Badge bay is 22m (24yd 2in) from the accessible entrance. 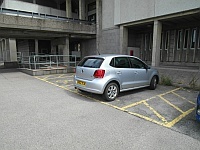 The furthest Blue Badge bay is 26m (28yd 1ft) from the accessible entrance. 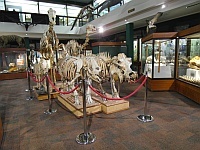 The maximum height is 250cm (8ft 2in). 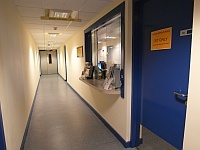 This information is for the entrance located leading from the car park. 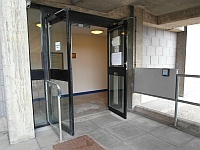 The automatic doors require a swipe card to activate, and open towards you. 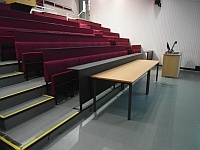 They are push pad operated from the inside. 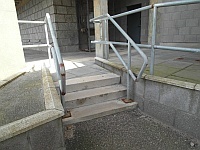 The ramp/slope is located leading up from the car park to the entrance. 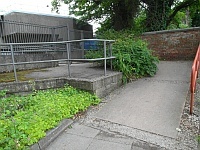 The step(s) is/are located leading up from the car park to the entrance. 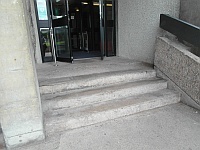 The lift does not bypass the step(s). 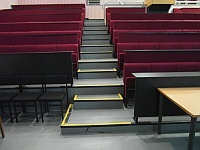 The lift does not bypass the ramp/slope. 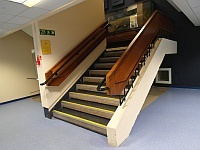 The lift is located next to the accessible entrance. 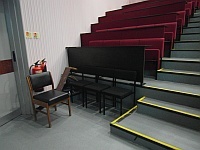 The dimensions of the lift are 97cm x 142cm (3ft 2in x 4ft 8in). 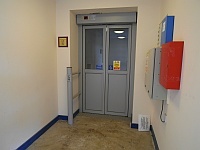 This lift gives access from the accessible entrance to the ground floor, next to the main entrance. 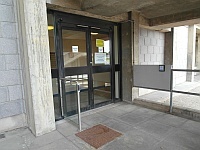 This information is for the entrance located on Tillydrone Avenue. 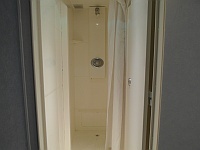 The width of the door opening is 149cm (4ft 11in). 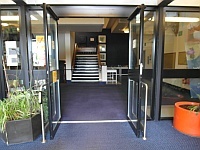 The automatic doors open towards you. 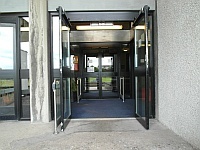 There are also manual doors next to the automatic doors. 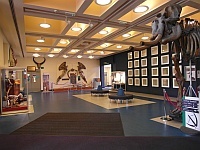 The main entrance gives access to the ground floor. 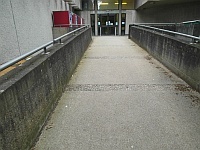 The step(s) is/are located leading up to the walkway from the pavement. 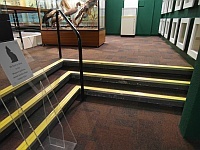 There are 3 further steps in front of the entrance. 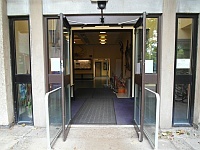 You are on Outside Access (Cruickshank Botanic Gardens Entrance). Skip to the next section. 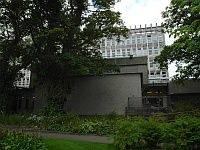 This information is for the entrance located at the rear of the building from the botanic gardens. 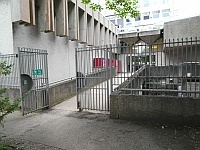 There is also a gate, 116cm wide, leading from the gardens to the ramp. 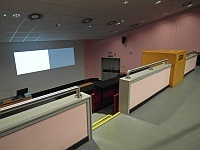 This entrance is located at the rear of the building, and gives access to the ground floor. You are on Level Change (Cruickshank Botanic Gardens Entrance). Skip to the next section. 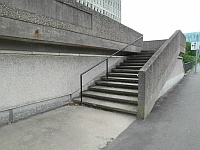 The ramp/slope is located leading up from the gardens to the entrance. 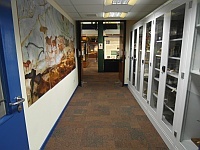 You are on Reception (Enquiries Point). Skip to the next section. 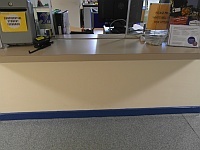 The desk/counter is 30m (32yd 2ft) from the accessible entrance lift. 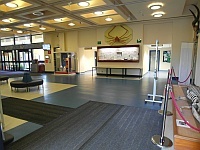 The enquiries desk is located on the ground floor, along to corridor next to the main lifts. 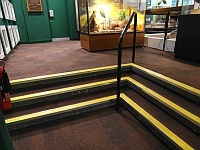 The floors which are accessible by stairs are LG, G, 1, 2 ,3 and 4. 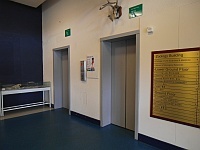 The lift is located in the main foyer, opposite the main entrance. 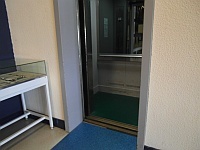 The floors which are accessible by this lift are LG, G, 1, 2 ,3 and 4. 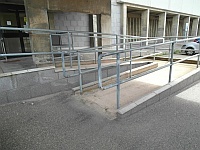 The lift is approximately 15m (16yd 1ft) from the accessible entrance lift. 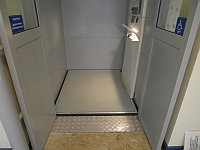 The dimensions of the lift are 90cm x 167cm (2ft 11in x 5ft 6in). 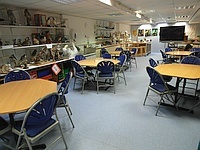 The clear floor space beneath tables in the room(s) is 68cm. 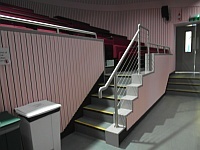 Level access to the wheelchair seating and speaker's area is via the lift to the lower ground floor. 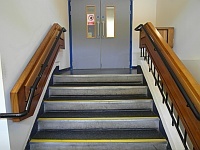 There are 3 clearly marked steps with a handrail on the right from the ground floor. 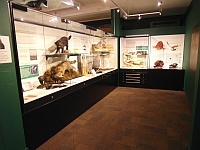 You are on Museum (Zoology Museum). Skip to the next section. 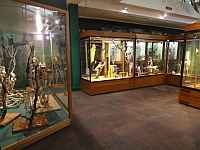 The museum is located on the lower floor. 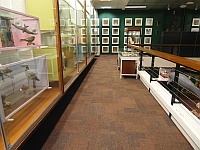 You are on Level Change (Upper Gallery). Skip to the next section. 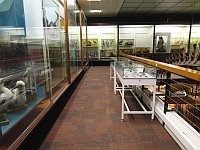 The step(s) is/are located on the ground floor leading to the museum balcony gallery. 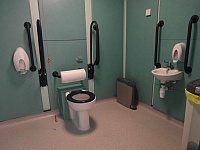 This accessible toilet is approximately 32m (34yd 2ft) from the accessible entrance lift. 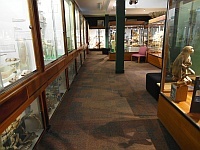 This accessible toilet is located just off the main foyer. 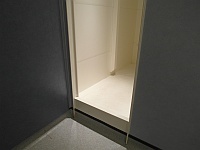 The dimensions of the accessible toilet are 197cm x 226cm (6ft 6in x 7ft 5in). 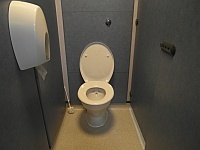 There are baby changing facilities located within the accessible toilet. 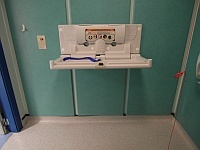 The height of the baby change table once extended is 84cm. 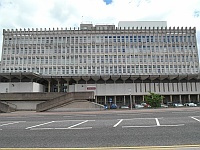 The female toilet facilities that were surveyed are located just off the main foyer. 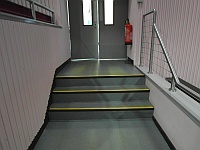 The female toilet(s) is/are approximately 29m (31yd 2ft) from the accessible entrance lift. 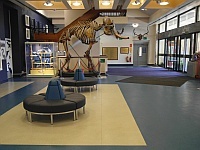 The male toilet facilities that were surveyed are located just off the main foyer. 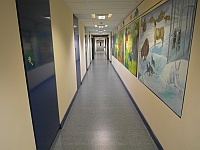 The male toilet(s) is/are approximately 25m (27yd 1ft) from the accessible entrance lift. 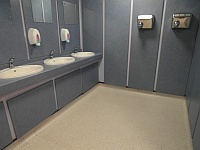 The standard toilets also contain showers, which are accessed via a deep step. 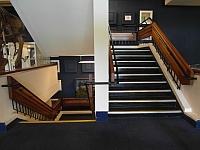 There are also standard toilets located on lower ground, first, second and third floors.